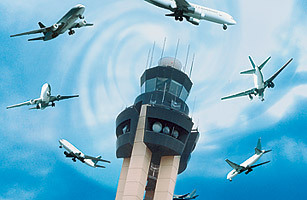 Current air traffic control systems are outdated, relying on repetitive voice communication. The shortest distance between two points is a straight line  unless you happen to be traveling in an airplane. Commercial airliners around the world follow circuitous flight paths, waste time in holding patterns before landing and burn precious fuel taxiing. Part of the blame can be placed on crowded airports and congested airspace, especially in heavily trafficked areas like New York City. But delays and inefficiencies in air travel are due in large part to an outdated traffic-control system that still relies on slow, ground-based radar stations and repetitive voice communication. "At this point, we're still operating with technology that dates back to World War II," says Marion Blakey, president of the Aerospace Industries Association and a former head of the Federal Aviation Administration (FAA). "We're sticking with cassette tapes when we should be moving to DVDs." It's bad enough that an archaic air-traffic-control system has led to pitiful performance: nearly 25% of U.S. flights were late in 2008. But inefficiencies in the air and on the ground caused by the system also mean fuel wasted and carbon dioxide emitted at the very time when the air-travel industry is coming under scrutiny for its role in climate change. Though airlines contribute only about 2% of global carbon emissions, that figure is set to rise as air travel expands, especially in the developing world. And for frequent travelers, flights can enlarge their personal carbon footprint  a round-trip journey between New York City and London emits 1.5 metric tons of CO2 per passenger. "We're 2%, but we are a very visible 2%," says Paul Steele, who directs environmental initiatives for the International Air Transport Association (IATA). As the world prepares for the next U.N. Climate Change Conference, known as COP15, in Copenhagen in December, the air-travel industry will be under increasing pressure to cut its emissions  or pay a carbon tax. Though next-generation jet biofuels made from algae or coconuts tend to get all the green hype, the best immediate opportunity for the industry to control carbon emissions will be through improving fuel efficiency  and the best way to do that is to pull an analog air-traffic-control system into the digital 21st century through what the FAA has dubbed NextGen. "The overall goal of NextGen is to increase capacity to meet demand while at the same time not growing carbon emissions," says Vicki Cox, the FAA's senior vice president for NextGen. NextGen is the FAA's long-term plan to replace the current radar-based air-traffic-control system with one that operates using satellites and a global positioning system. (Europe is working on a similar upgrade with its Single European Sky initiative.) Instead of a radar system that updates the positions of planes only as often as its dish rotates  every 12 sec. or so  NextGen will use satellite data to locate planes in real time, thanks to the Automatic Dependent Surveillance-Broadcast (ADS-B) system. Instead of relying on time-consuming voice communication with a control tower, pilots will instantly know the location, speed and direction of the planes around them. It's not unlike the GPS system you might use in your car  if your GPS could tell you what every other vehicle on the road was doing all the time. "The new system gives pilots a heightened awareness of the airspace around them and helps controllers efficiently direct the tens of thousands of flights that crisscross the country daily," says Steve Loranger, chief executive of ITT Corp., which is developing the ADS-B system for the FAA.